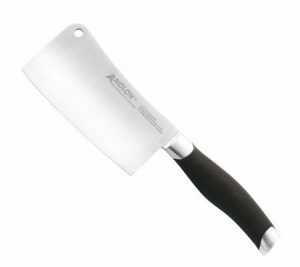 When it comes time to buy a new set of kitchen cutlery, it helps to know a little bit about the types of kitchen knives there are on the market. That way, you can ensure you get the right types for the kinds of cooking you plan to do. While it would be easier to buy each blade type that you need individually, you get a big discount when you buy a set. The best option is to find a set that has most of the pieces you need, then add to it by buying the items you still need separately. Unless you need a lot of specialty pieces, chances are you will save money this way. The terms mincing and dicing refer to a cutting action in which food is slid underneath the rear part of the blade as it is lifted. It is cut as the blade is quickly rocked back and forth while the food is slid underneath. We’ve all seen the professional chef’s on TV make quick work of onions, carrots and any number of fruits and vegetables using this method. They make it look simple, and with a little practice, you can get every bit as good at it as they are. 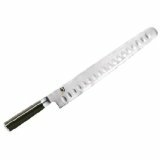 You need a razor sharp chef’s knife to get the job done, as the cutting is done by pushing the edge of the blade through the food as opposed to slicing it. A dull edge will crush and mangle delicate foods. Slicing is done with a back and forth motion, and is the method most people think of when they picture someone cutting something. Common slicers include filet and boning knives, which can be used to remove meat from the bones of fish and poultry. 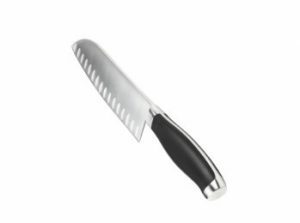 Another common slicer has a long, serrated blade and is used for slicing bread. Serrated edged work much better than straight edges for slicing bread because they grab hold of it and keep the blade in place. The types of kitchen knives you need depends entirely upon the types of cooking you plan to do. If you cook lots of meats and poultry, you will need boners, slicers and a cleaver at the bare minimum. If you primarily cook and cut veggies and fruits, you’ll be better off with a variety of slicers and peelers. The best set for you is the one that will work best in your kitchen, and no two kitchens are alike. After you take a moment to think about the types of blades you’re going to need, you need to think about how much you want to spend. You need to buy the best set you can reasonable afford, as knives are one of those items where you get what you pay for. Spending a little extra will net you a better set and might just save you money in the long run. The better sets tend to last longer, so you won’t have to replace them as often. Now that you know a little about the types of kitchen knives, it’s time to go shopping. Go to the kitchen knife set section of this site or click on one of the manufacturers in the side bar for more information.